The temperate E. coli phage N15 has been known since 1964 when Victor Ravin isolated the phage from sewage in Moscow, Russia. It is the only linear plasmid found in E. coli. 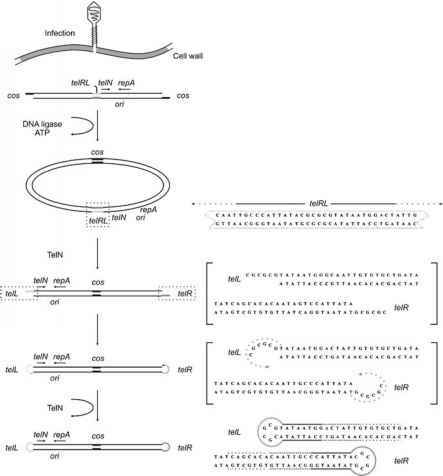 Phage PY54 was recovered after mitomycin C treatment of a non-pathogenic Yersinia enterocolitica strain isolated from food in Germany (Popp et al. 2000). The ^KO2 plasmid was detected in a nickel-resistant Klebsiella oxytoca strain isolated from the mineral oil-water coolant-lubricant emulsion of a metal working machine in Sweden (Stoppel et al. 1995). Despite their completely different origins, the three temperate phages share some striking similarities. They exhibit a lambda-like morphology with a hexagonal head and a long, non-contractile tail. N15 and PY54 have a rather narrow host range exclusively infecting E. coli and some Y. enterocolitica strains, respectively, while ^KO2 could not be propagated on indicator bacteria as yet. It is not clear whether this phage is defective or if it has an unusual host specificity. The genomes of the three phages are composed of linear double-stranded DNA, which is 46.3 kb (N15, PY54) and 51.6 kb (^KO2) in size. Contrary to N15, which has 12-bp overhangs at the 5' ends of the genome, very similar to lambda, the PY54 and ^KO2 cohesive ends are 10 bp long and protruding at the 3' ends. Fig. 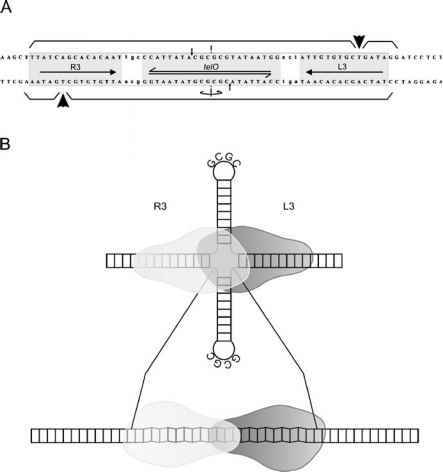 1 Conversion of the linear N15 phage genome into the linear plasmid prophage. Upon infection the phage genome circularizes by its cohesive ends (cos). The circular molecule is then subjected to telomere resolution. The telomere resolution site (telRL) located opposite to cos is processed by the protelomerase TelN, resulting in a linear plasmid with covalently closed ends (see text for details). For better understanding, sequences shown in brackets depict probable intermediates of the reaction observations: (1) terminal, but not internal, restriction fragments renature rapidly after heat denaturation and quick cooling; and (2) treatment of plas-mid DNA with the S1 nuclease, which cuts single-stranded DNA, abolishes this effect (Svarchevsky and Rybchin 1984). The size and sequence of each plasmid are the same as those of the respective phage genome but both molecules are approximately 50% circularly permuted, which means that the end sequences of the genomes are located in the middle of the plasmids and vice versa. Figure 1 illustrates the conversion of the N15 linear genome into the linear plasmid. Upon infection of a host cell, the phage genome circularizes by its cohesive ends. Following this step, a phage-encoded enzyme termed protelomerase (prokaryotic telomerase, see Sect. 3) cleaves by staggered cuts a palindromic target sequence (telRL) located opposite to cos. The overhanging DNA strands are self-complementary and therefore able to fold back. Two new phosphodiester bonds are formed, resulting in the linear plas-mid with covalently closed ends. The exact mechanism of lytic replication at which the linear plasmid is converted into the linear genome has not yet been elucidated. However, it is assumed that similar to lytic growth starts with circular molecules that are used for rolling circle replication leading to concatemeres. Single genomes are then generated by site-specific cleavage at cos and packed into capsids.